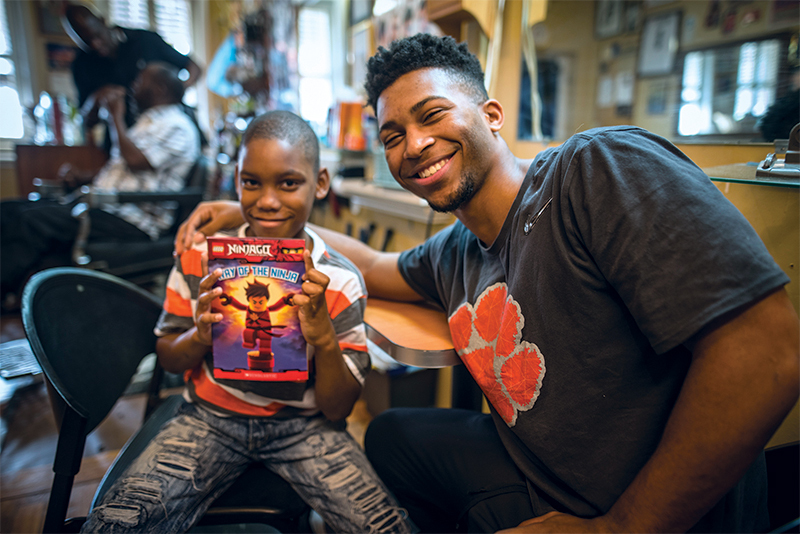 Tydarius Cobb, 9, poses with Clemson University student Deavin Rencher, a sophomore studying special education and member of the Call Me MISTER program, at the Uptown Barbers barber shop in Central, S.C., after reading the book he’s holding as part of the Razor Readers program. 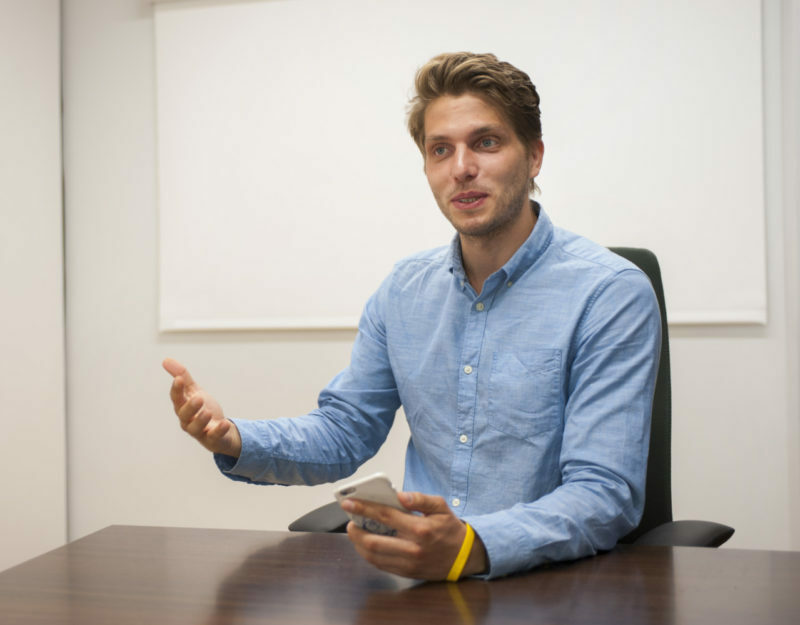 DeAvin Rencher is a fixture at Uptown Barbers in Central. But he’s not a customer or barber. He’s a special education major at Clemson and Call Me MISTER® student who works with kids through the Razor Readers program. The Call Me MISTER program is sending its students to local barbershops each week to educate school children and their parents on the importance of reading early and often. These weekly sessions are the focus of Razor Readers, a program funded by the United Way of Pickens County that aims to increase children’s access to reading materials and individuals who can serve as educational role models. Children can read while waiting in line for haircuts or in their free time. Barbers have punch cards for each child that when filled qualify them for a free haircut. Before and during haircuts, MISTERs guide parents through early education tools that will help parents engage with their children and encourage reading at home and school. Smiley Garvin, owner and operator of Uptown Barbers, replaced an unused barber chair with a table and chairs for Rencher and the kids. He believes kids who come in and out of the shop are quicker to embrace reading in a setting that isn’t school, home or library. Levi “T” Robinson owns D’s Diamond Cuts, another participating barbershop, in Easley. He has created flyers for the program that he distributed via local churches and has been thrilled to see kids returning to the shop not for another haircut, but for more books. Call Me MISTER began at Clemson in 2000. Since then, the program has graduated 203 MISTERs who are now teaching in South Carolina schools and has expanded to include 19 other universities and technical colleges in South Carolina, as well as programs in eight additional states. 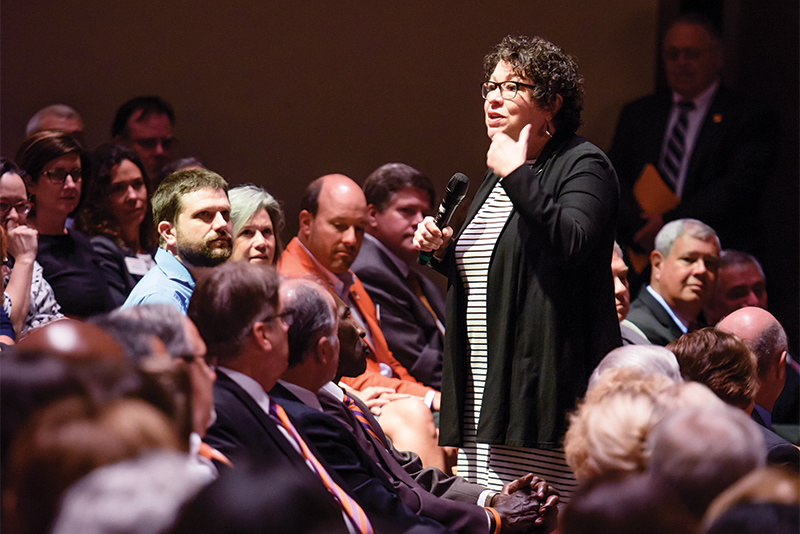 When Sonia Sotomayor came to Clemson on Sept. 14, President Clements noted that it was the first time a sitting justice of the U.S. Supreme Court had spoken on campus. But Justice Sotomayor made sure there was very little sitting. She moved through the packed house of more than 900 members of the University community, stopping several times to organize group photos as she candidly answered questions submitted in advance by students. Vernon Burton, professor of history and director of the Clemson CyberInstitute, introduced Sotomayor as “not only my friend, but a true American hero.” The two have known each other since their days at Princeton University, where Sotomayor was once his research assistant. Sotomayor spent an hour answering questions while weaving in personal anecdotes, inspiration and advice. Philosophy major Chiodera “ChiChi” Drayton-Smith asked Sotomayor what parts of her journey to becoming a Supreme Court justice were unexpected. Sotomayor responded that every turn was unexpected. Sotomayor, who has served on the U.S. Supreme Court since 2009, grew up in public housing in the Bronx, New York. As a child, she never dreamed of being a lawyer or a judge, much less a Supreme Court justice. “To dream about something you don’t know is impossible,” she said. Sotomayor went from the Bronx to Princeton, where she won the university’s highest academic honor. She attended law school at Yale and was editor of its law journal. After graduation, Sotomayor worked in the public and private sector, serving as an assistant district attorney in New York and was a partner at the law firm Pavia & Harcourt. She was appointed to the U.S. District Court, Southern District of New York, then served as a judge on the United States Court of Appeals for the Second Circuit before President Barack Obama nominated her as an associate justice of the Supreme Court in 2009. Haley McKay, who is studying women’s leadership and communication and minoring in Spanish, wanted to know Sotomayor’s philosophy on leadership. Students were clearly taken by Sotomayor’s dynamic talk. “As a Latina, to see someone like me presented on this campus, that’s so important to see,” said Amanda Arroyo, a graduate student in the department of history. “It’s nice to see someone that’s made it so far,” she said. Sotomayor closed her appearance by talking about the difference between law and justice. William Powell, a student in modern languages, had asked what young people should know about the field of law. “Let me start with what the law is not. It’s not about moral justice,” Sotomayor said. “One person’s justice is another person’s injustice.” In her field, there must be a steadfast belief in the rule of law, and Sotomayor has faith in the system she’s chosen. Sotomayor’s visit was sponsored by the President’s Forum on Inclusive Excellence in partnership with the Humanities Advancement board of the College of Architecture, Arts and Humanities.